Technology grows as fast as your kids and keeping in touch with the drip just makes life so energized! Microsoft Dynamics CRM v8.0.0.xxxx (2016) was released last Fall offering more functionality at the deepest level and more options and functionality at the user level. Take for instance the new "Interactive Service Hub". A graphical interface in addition to ALL you have through dashboards, charts and views and then you also have new options around knowledge management and at the deepest level new formats for fields. Even more important, the incredible ground work around mobile and the mastery of DISTRIBUTED PROCESSING leveraging Azure. Distributed processing with any technology is not easy; although in the world of Microsoft CRM we have long had the Outlook Client, still we needed more options and now we have more options. The synchronization of data between multiple source locations is just ripe with potential difficulty and yet, here you have in CRM 2016 some great MOBILE Answers to a tough need. Now before you start thinking about all that you have not yet tried in the FALL CRM 2016 release (v8.0.0.xxxx) understand that the SPRING 2016 release is rolling out to the customer focus group now. A group of customers who totally get keeping up and have signed up and agreed to test the new software before it is generally available. A win/win situation for the product development teams and for customers. A team approach using real world solutions. The Spring release is PACKED! The teams are leveraging not only the power of Microsoft Dynamics CRM (and it really is powerful and occassionally taken for granite), but the depth and power of AZURE, the Out of the Box integration to Office 365 and SharePoint and the maturely integrated solutions like portal and field services. Given how quickly everything is rolling out the teams have also released a new ROADMAP website so you can immediately know what has been released, what is being released and what is pending for the next update. It is easy to get caught up in the buzz, so this site is available for immediate validation. Microsoft Social Engagement is now getting monthly updates. and then there are versions all the other enhancements on the same page to also catch up on. What? You are interested in Machine Learning? Did you know MSE is ALREADY leveraging the power? Wow! I work at Microsoft as part of the Microsoft Global Dynamics Domain focused on services. Keeping up with all of the GREAT old and new functionalities can sometimes be interesting, but it is such a thrill to have such a huge tool chest of options for clients in this complex world. A world where technology, configurable technology can offer a great competitive differentiator. 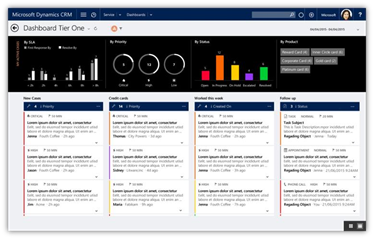 Tags: CRM Whats New, Dynamics CRM 2016, What's New in Dynamics CRM.